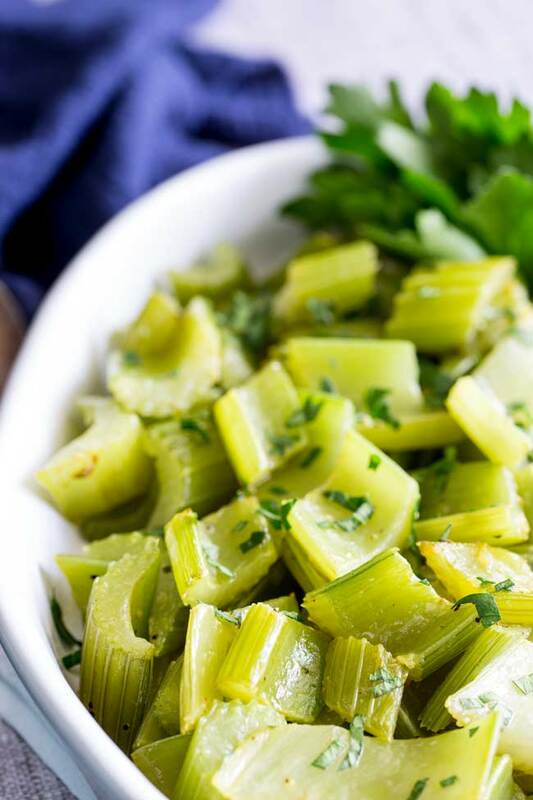 This braised celery really is such a simple side dish. The recipe has just 5 ingredients, including salt and pepper; turning an underused vegetable into a delicious savory side. The celery mellows as it cooks, yielding to a knife but still with enough crunch to keep it interesting. Perfect to pair with meat for a low carb dinner. 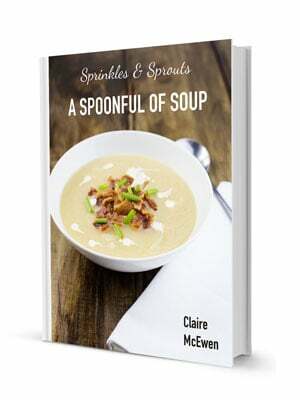 Or add it to your Thanksgiving or holiday table for something a little different! Do you ever buy a head of celery, use one stalk and then forget about the rest in the bottom of the refrigerator? A week later you are left with a sad floppy celery head? I mean there is only so much celery and cream cheese you can eat! Which is why this recipe is such a great one. 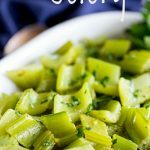 You can use up those leftover celery hearts, make a low carb side and feel better about the world because no one likes food wastage. 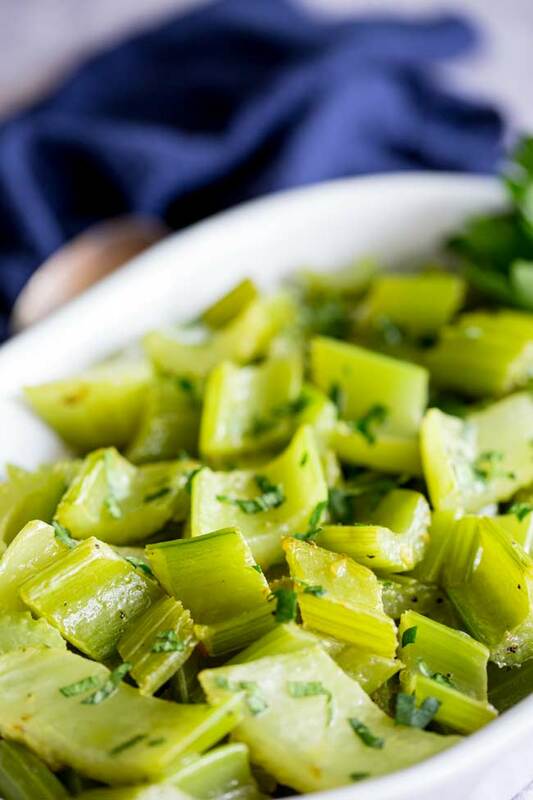 Oh and did I mention that braised celery tastes amazing! 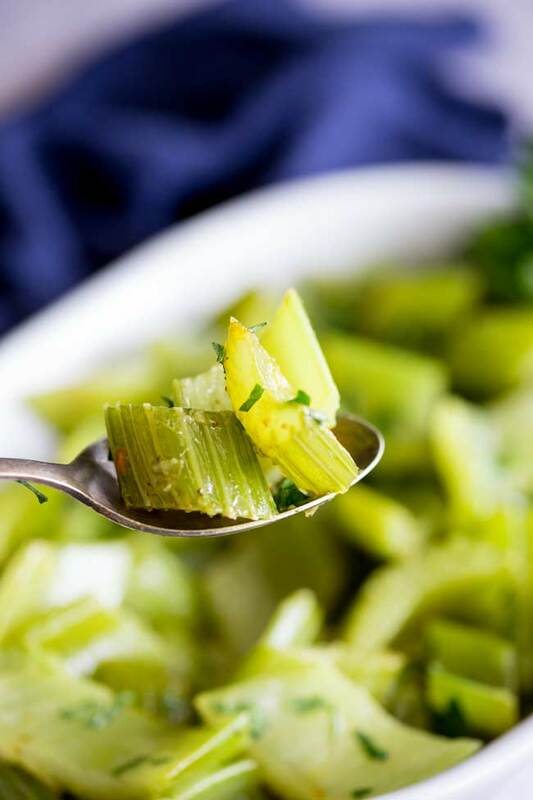 Imagine the beautiful mellow flavor of celery from your favorite chicken noodle soup or chicken stew. That savory deliciousness, soft and yielding and so delicious. Well now you can have it as a side! WHAT??? 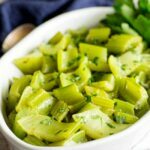 Can you cook celery as a side dish? I know right, we cook with it for our soups and stews but it rarely gets seen as a vegetable worthy of it’s own serving dish! I think we forget about it, we just use it as a flavor base. 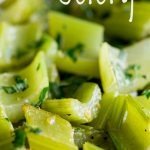 Much like onions, which I heroed in my Sweet Onion Casserole, I want to hero the celery and say no more do you have to go floppy at the bottom of the crisper drawer! Today you can play a staring role in dinner, you can be served as a side to the grilled chicken or better yet a smoked pork chop! You can take your place with all your vegetable friends amongst the other side dishes to grace our thanksgiving table. You will be perfect next to the leftover Christmas ham on boxing day. 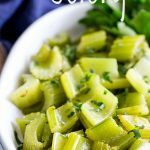 You want the celery to still have some shape and texture, so this dish takes under 15 minutes to cook. The celery is first sauteed in a little butter, then cooked over a low heat with some vegetable stock (or chicken stock). A final seasoning of salt and pepper and you have your braised celery side dish done. How easy!!! Plus you don’t need any herb garnish because you can add a couple of the celery leaves! Wash the celery then top and tail it, reserving any leaves for later. Cut the celery, on the diagonal, into 1 inch chunks. Add the celery, salt and pepper, then sauté gently for 5 minutes until it has started to soften. Remove the lid and cook for a further 5 minutes so the liquid can evaporate. Serve garnished with any reserved leaves. 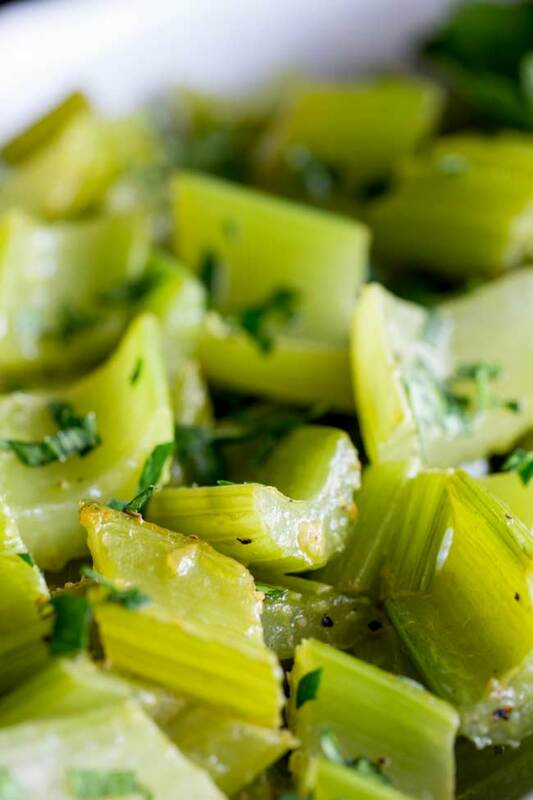 If you love food why not subscribe to my newsletter, I will drop you an email every now and then, just to say hi and send you a couple of recipes I think you might love, like this simple side dish of Braised Celery.